I love sea shells. I always will. Today I went with my husband and kids to climb sand dunes along the beach we are staying at. There were hundreds of tiny shells dotted around the dunes, just like the swirly brown one, top left. I filled my pockets as we climbed and slid down the dunes. These will serve as a holiday souvenir as we head home tomorrow. i have a collection of seashells, too. we don't have many varieties here on cape cod, but i have some that my uncle collected around the world -- so lovely. i love that long spiny on on the right. really neat. She sells sea shells by the sea shore! Just beautiful. You've inspired me to think about putting a collage of these beauties in a frame and put on my wall. You have a great collection there! 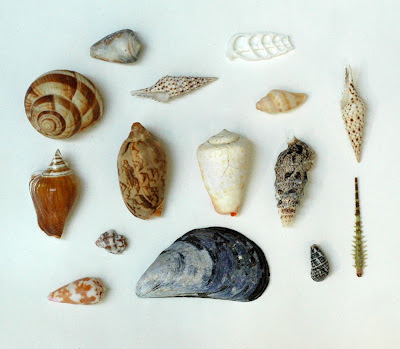 I love collections and those are beautiful for sure, but I think shells should be in the nature, not in someone's collection.